Members: Ali McKenzie: vocals - Ron Wood: lead guitar, vocals - Tony Munroe: rhythm guitar, vocals - Kim Gardner: bass, vocals - Pete McDaniels: drums. 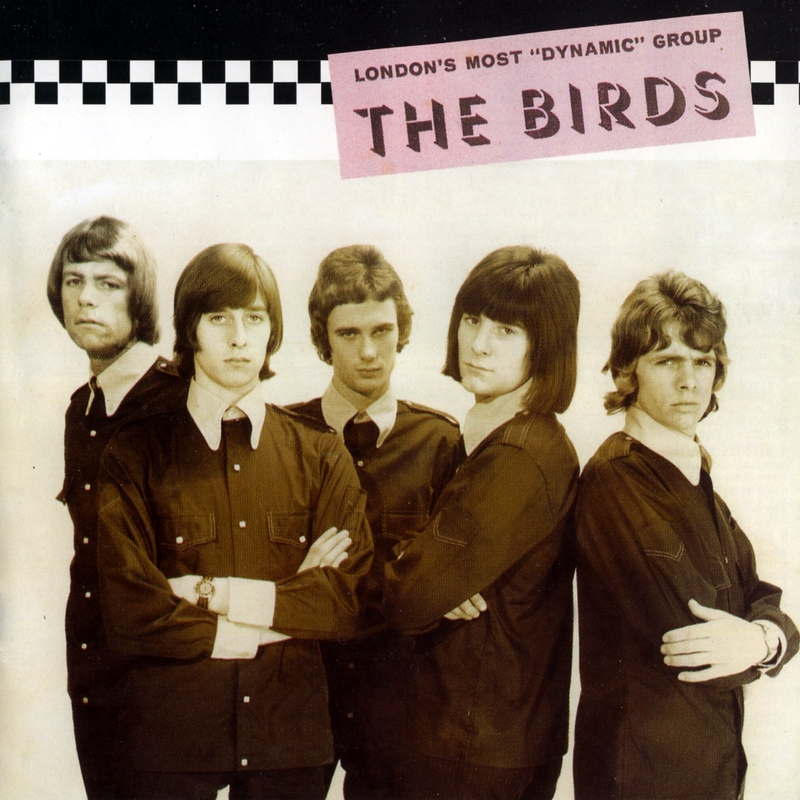 The Birds were one of the hard-luck outfits in the annals of '60s British rock. By reputation, they were one of the top R&B-based outfits in England during the mid-'60s, with a sound as hard and appealing as the Who, the Yardbirds, or the Small Faces. In contrast to a lot of other acts that never charted a hit, the Birds are remembered slightly by some serious fans, and are mentioned in several history books -- but for entirely the wrong reasons. the Birds are remembered for the fact that Ron Wood got his start in the band before moving on to bigger things with the Faces and the Rolling Stones; and that they shared a name, albeit spelled differently, with an American band of considerable prominence. Nobody knows a lot about their music, however, which, on record, consisted of fewer than a dozen songs. Ron Wood (guitar, harmonica, vocals), Tony Munroe (guitar, vocals), and Kim Gardner (bass) grew up within a block of each other, along with original drummer Bob Langham (succeeded by Pete Hocking, aka Pete McDaniels), and had gotten together with lead singer Ali McKenzie to form a band in 1964, while all were in their teens. They were based in Yiewsley in West London, and played the local community center regularly, building up a serious following, which led to their turning professional. 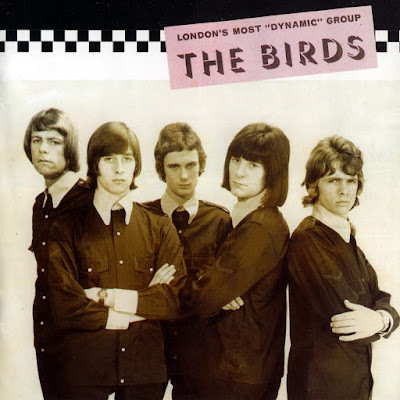 The name the Birds came about when they were forced to change their original name, the Thunderbirds, owing to the name of Chris Farlowe's backing band of the period. Their music was hard R&B with a real edge to to it, and was good enough to get them into in a battle-of-the-bands contest held under the aegis of Ready, Steady, Go, the weekly music showcase series. They didn't win, but got a television appearance out of it, on which they were spotted by executives from Decca -- a contract followed, resulting in the recording of their first single, "You Don't Love Me," in November of 1964. Early the following spring, they tried again with a second single, "Leaving Here," which they got to perform on television. The group seemed poised for success. Their bookings placed them ahead of the Pretty Things and the early Jeff Beck group the Tridents, and they were billed with the Who on some of the same gigs. In that company, there seemed to be no way that they could fail, especially with their sound, a loud, crunchy brand of British rhythm & blues-based rock, roughly akin to early Who, the Yardbirds, and the Kinks. Disaster struck the band from a completely unexpected quarter -- across the Atlantic -- at in the spring of 1965, however. Fresh off of their first U.S. hit came a Los Angeles-based quintet called the Byrds. Their debut single, "Mr. Tambourine Man," released on the newly established British CBS Records label, was burning up the British charts, and "Leaving Here" by the Birds was left there, on record store shelves (when it was ordered at all). 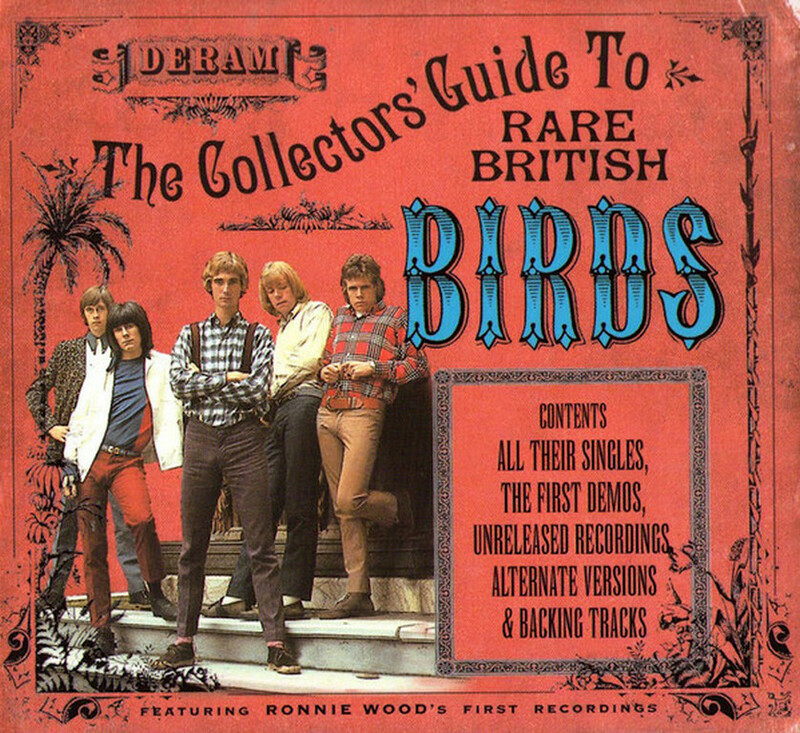 That summer the rival group toured England for the first time, and although the Birds' manager tried to take legal action, it was to no avail -- the spellings were different, and both groups' claim to the name were about equally good. A third Decca single in late 1965 brought their relationship with that label to an end. 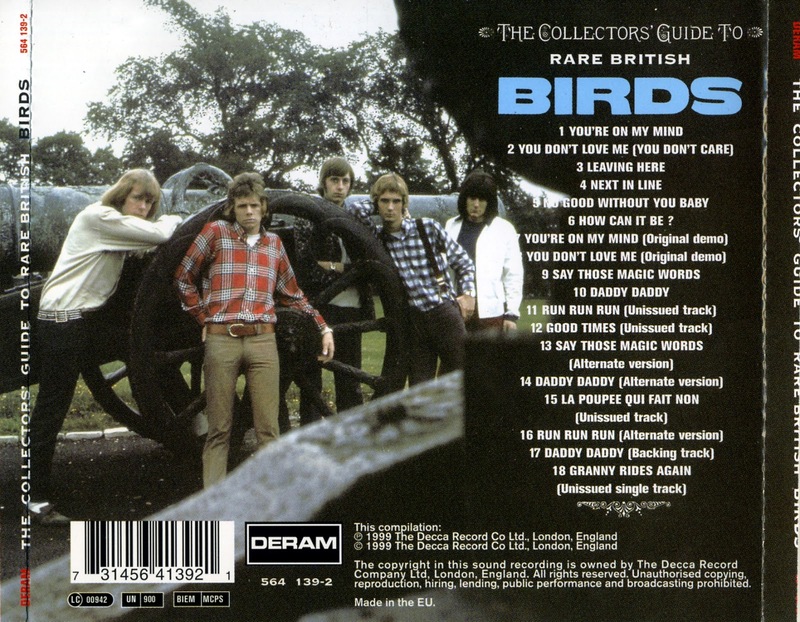 The group then moved to Reaction Records, at first under the name Birds Birds, but their debut single for the label, "Say Those Magic Words," was delayed in release for almost a year due to a contractual dispute. They also cut a version of Pete Townshend's "Run Run Run" highlighted by Wood's crunchy guitar and McKenzie's punked-out vocals, that could've given the Who a run for their money in a chase up the charts by rival singles. And they got one delightfully bizarre film appearance under their belt, performing a Ron Wood/Tony Munroe song, "That's All I Need," in the horror chiller The Deadly Bees, in 1966. Munroe was out of the band not long after, and Wood left in 1967, passing through the lineup of the Jeff Beck Group before joining the reconfigured (Small) Faces with Rod Stewart in 1969.
the Birds were one of the better bands of their era, as evidenced by the large following they built up from their live performances, playing a hard, loud brand of R&B, with polished vocals and a forceful, crunchy guitar sound. They weren't far removed from the Small Faces or the Who in sound, and perhaps they might've fared better, or had a longer run at success, if they hadn't been signed to a label that already had the Small Faces and the Rolling Stones under contract. The name confusion probably killed whatever chance they had of cracking the English charts, as well as eclipsing their musical virtues for posterity. This is an astonishingly lively and exciting collection, coming from a band that scarcely sold any records in their own time and are known today for their name and their lineup, but not their music. The stuff here is as crunchy and grinding as the early Who material, and if the band's own songwriting isn't as distinctive, the style of the performing is more appealing. The songs range from some hot Ron Wood originals ("You're on My Mind," "Next in Line," "That's All I Need") to covers of obscure Motown songs and Pete Townshend material. Think of the Kinks from "Long Tall Sally," the Yardbirds from "A Certain Girl," or the Who from "The Good's Gone" and that's the dominant sound here -- curiously, their cover of Townshend's "Run Run Run" starts out as though it's going to turn into "My Generation." Ali MacKenzie sounded like a punkier Roger Daltrey, and Ron Wood's playing was a delightful compendium of rhythm fills and angular blues licks that must've been devastating on-stage. There's also an unlisted bonus track on the CD -- at the risk of spoiling the surprise, it's their number from the 1966 horror film The Deadly Bees, which seems not to have survived as a formal, free-standing studio master.